This Disklavier™ DGB1K Enspire model is a superb Yamaha Grand Piano, a top-classgrand piano that combines subtlety with power, which ALSO incorporates ahighly accurate record-capable reproducing player system forentertainment and educational uses. 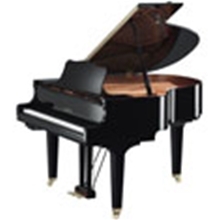 The Disklavier ENSPIRE CL was conceived specifically for the lovers of piano music. An affordable space-saving design brings the splendor of enjoying thousands of solo and ensemble piano performances, streaming radio and live or on-demand concerts. With its ability to captivate and inspire, the ENSPIRE CL is a classic and elegant entertainer - simple, intuitive and intelligent.